A raised smoking tax is on the November ballot. KANSAS CITY, MO. -- Patrick Reynolds is the grandson of the founder of the RJ Reynolds Tobacco Company. But he came here to Missouri to support the tobacco tax, Amendment Three on the November ballot. "This is a tax on tobacco," Reynolds said. "It will provide for tobacco education and prevention funding for kid's medical care for people who can't afford it." Here's how the tax breaks down: right now Missourians pay 17 cents a pack for cigarettes, that's the second lowest tax in the country. 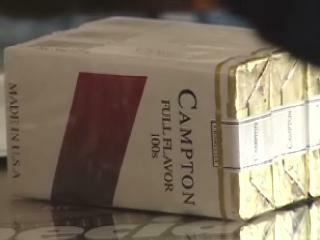 The 470 percent increase brings it up to 97 cents a pack, still lower than the national average of a dollar a pack. The tax on other tobacco products will go from a 10 percent tax to a 30 percent tax. "When we raise the price of cigarettes, it causes adults to quit and kids to not start," Reynolds said. Ron Spidle is the owner of Smokes 4 Less and is with Missourians Against Unfair Taxes. Opponents said a 470 percent increase was just too much. "We feel it's unfair for 25 percent of the population, which is what they say is tobacco users is, to pay 350 to 400 million a year in extra taxes," Spidle said. Opponents also argued that having cheap cigarettes is good for missouri's economy. "It generates a lot of revenue for the state of Missouri when we boarder other states and people travel through and it generates a lot of revenue for the state of Missouri," Spidle said. If it passes, the tax money would go to smoking prevention programs and health care costs. Supporters said right now the state of Missouri spends nothing on prevention programs and that's why this is so necessary. But opponents said the money is going to hospitals and HMOs and drug companies, not towards helping kids. Supporters said that's not true. "No one is getting rich off of this, it will take the burden off the hospitals," Reynolds said. The state already got a billion dollars from the tobacco lawsuit settlement, but right now none of that goes to smoking prevention. "They've already got a billion dollars and now they want another $400 million a year and that's unfair," Spidle said. Supporters said the fact that this is a constitutional amendment will guarantee the money goes where it's supposed to go. "We hear the legislature will take that money and run," Reynolds said. "That's why its a constitutional amendment so the legislature can't get its hands on the money." And they said the amendment calls for annual audits and controls to make sure Missourians are getting what they're paying for. See how Missouri compares nationwide with tobacco taxes.